At Spenser’s Quality Automotive, we understand the necessity of having a dependable working vehicle to commute through the Denton and North Dallas area. We are dedicated to completing the finest automotive repairs and maintenance work possible in a timely manner, on your schedule. We work on all makes and models, both foreign and domestic, making us the experts in vehicle repair and car care. Our experienced auto technicians have been serving the Denton area in the same location since 1999. Our shop is convenient to find and equipped with modern technology to assure the capability of finding and fixing anything that may be wrong with your vehicle. Owner Spenser Davis and office manager Brandon Hughes are industry experts who hire only the top talent in automotive repair to assure you receive not only the highest quality workmanship but also the most courteous and respectful service in the industry. Spenser’s Quality Automotive has received the honor of winning the Denton AASP Technician Challenge four years in a row, proving we are the leaders in automotive care and repair. In most cases, our skilled technicians can offer same-day turnaround on auto repairs, and our staff is equipped to offer not only maintenance but full mechanical repairs. For the convenience of our customers, we offer free shuttle service to and from our location within the Denton city limits. Spenser’s Quality Automotive offers O.E.M. capabilities for diagnosis and repair of most foreign and domestic vehicles at a fraction of the cost. 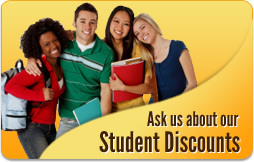 Student discounts are available for many services, making us the frequent choice for attendees of the University of North Texas, North Central Texas College, and Texas Woman’s University. For top automotive care and maintenance, as well as repairs and services, trust the industry leaders in Denton to provide excellent service and quality workmanship!